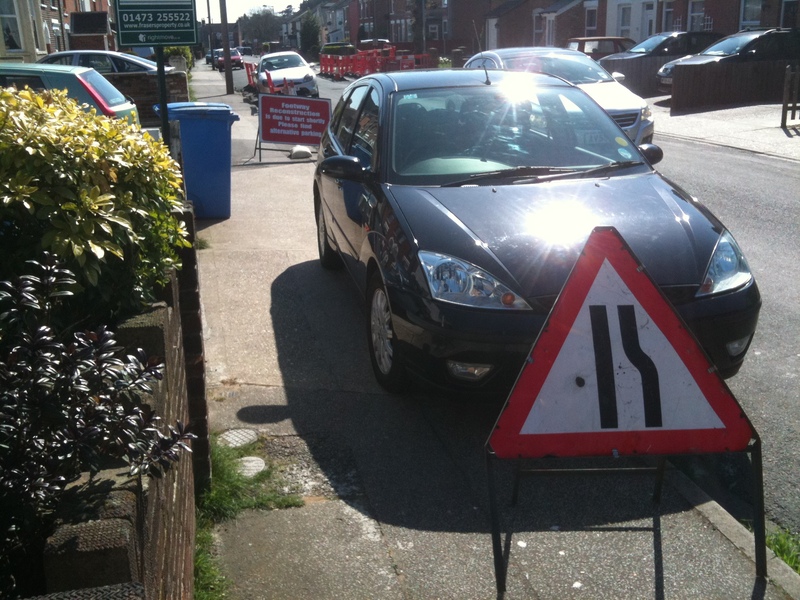 Some time back I blogged about an unusual sign which seemed asked drivers to park off the pavement while it was being resurfaced. The sign didn’t seem to question the cars’ right to be there. 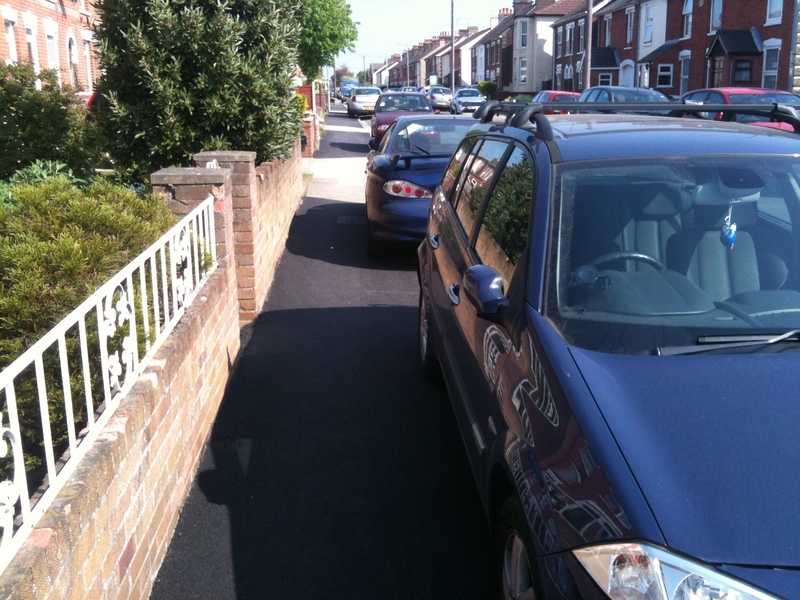 The good news (for motorists who park on that particular pavement) is that the work is now complete and the pavement is again available for parking. The bad news (for everyone else) is that we all paid for this work through general council tax which was only necessary because the cars had broken the slabs and we still can’t use the pavement easily cos of all the cars parked across it! Incidentally, on this particular street it isn’t practical for wheelchair users to use the road because of all the speed humps. Here are a couple of photos. The first was taken after the work on this part of the pavement was complete, the second was taken during the works showing cars, signs and bins obstructing the pavement. Why can’t the workmen leave their signs on the road! For a game of ‘Pavement Wipeout’ all we need is some randomly distributed fresh dog-turds and then some elderly pedestrians or some children corralled to take their chances. The wheelchair-event has to be cancelled, because there isn’t sufficient width. 2 possible solutions. 1/ Put bollards up everywhere in roads like this. 2/ Go for shared space, get rid of pavements and roads, allow everyone to use whatever part of the common space they want. that means that if people park inconsiderately like this it won’t matter because pedestrians can just walk down the middle. It might hold up the traffic but I’m certain that motorists won’t mind, after all, they will be able to park even closer to the edge of the highway!